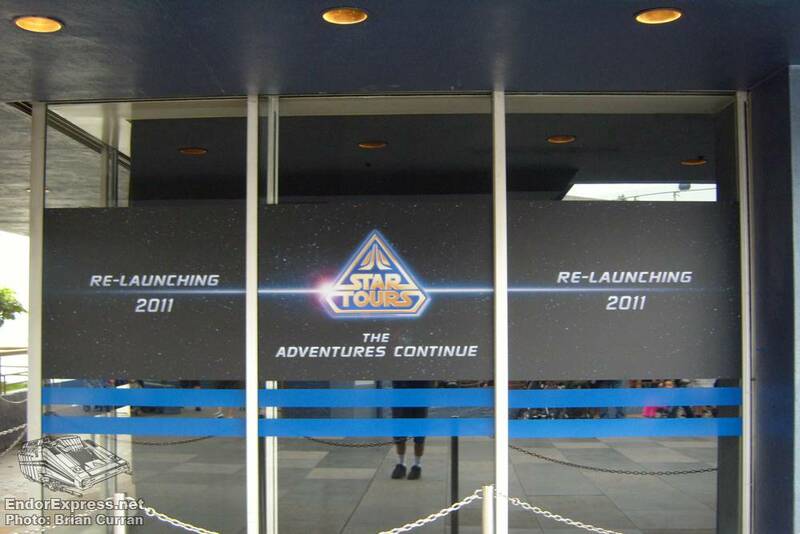 The following are photo’s taken on July 26, 2010. 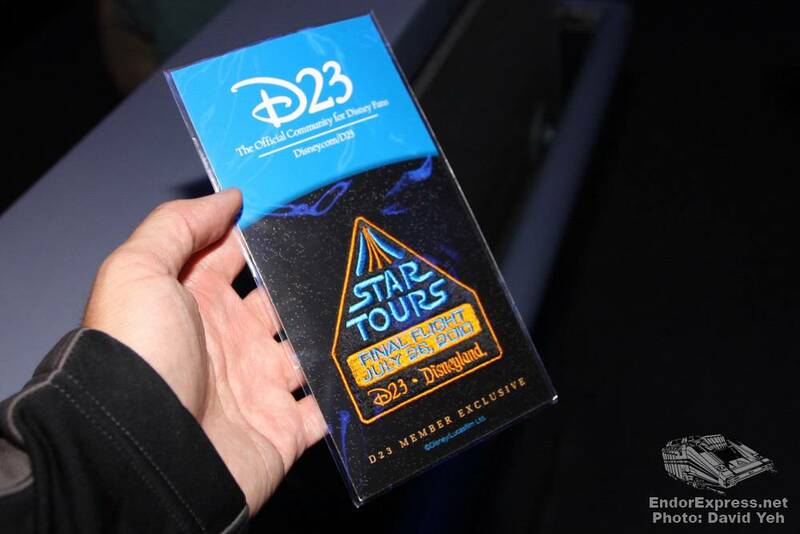 The last day of operation for the original Star Tours and the D23: Final Flight event at Disneyland in Anaheim, California. 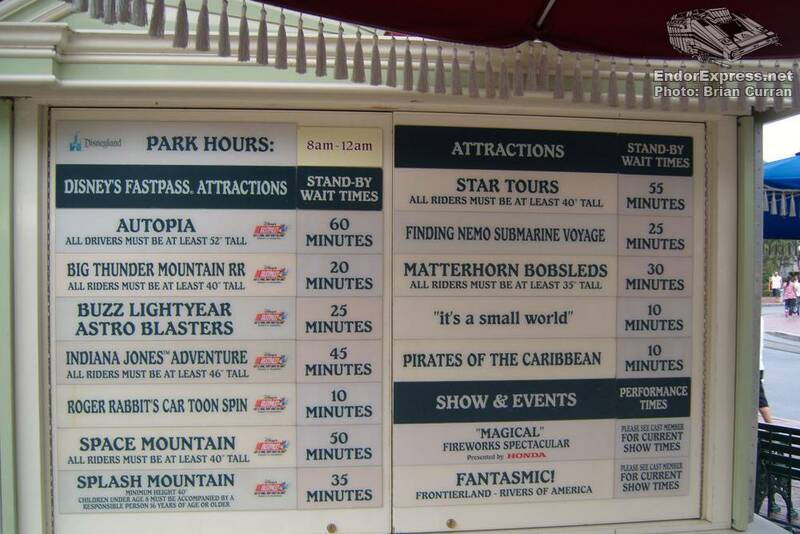 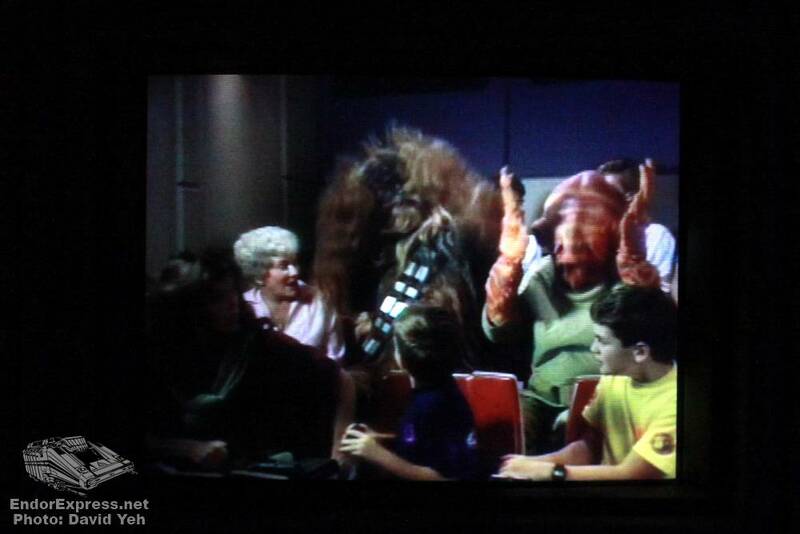 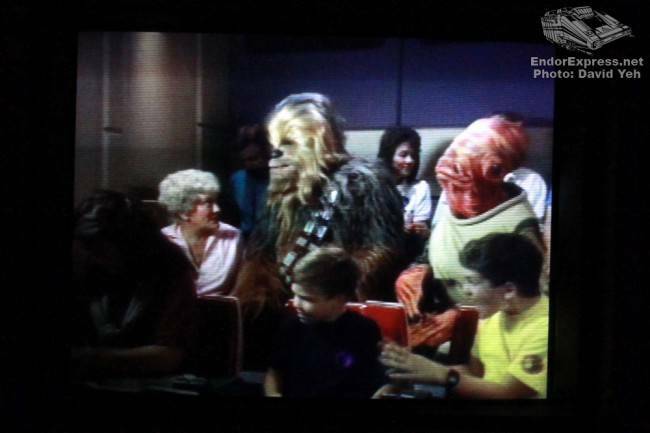 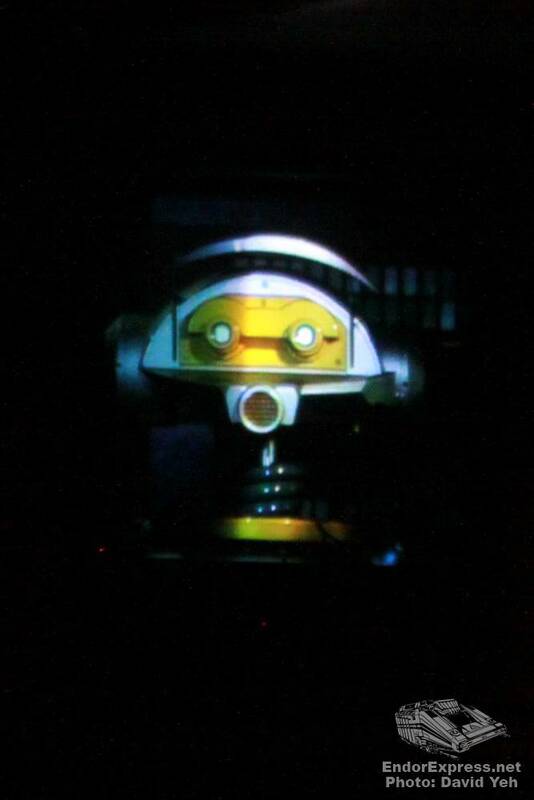 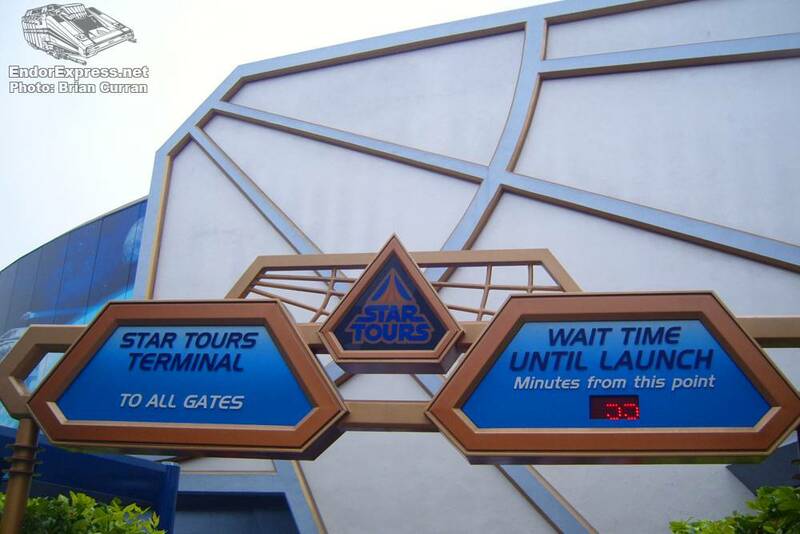 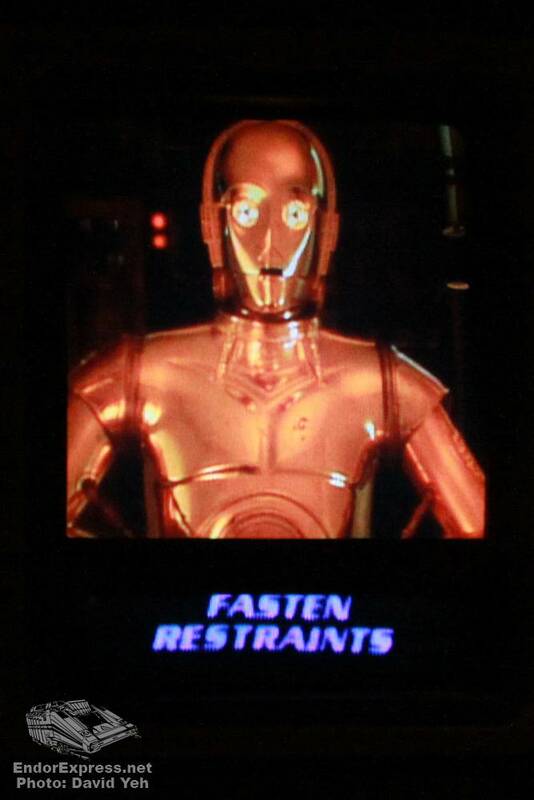 The wait to get on Star Tours was about a hour long all day. 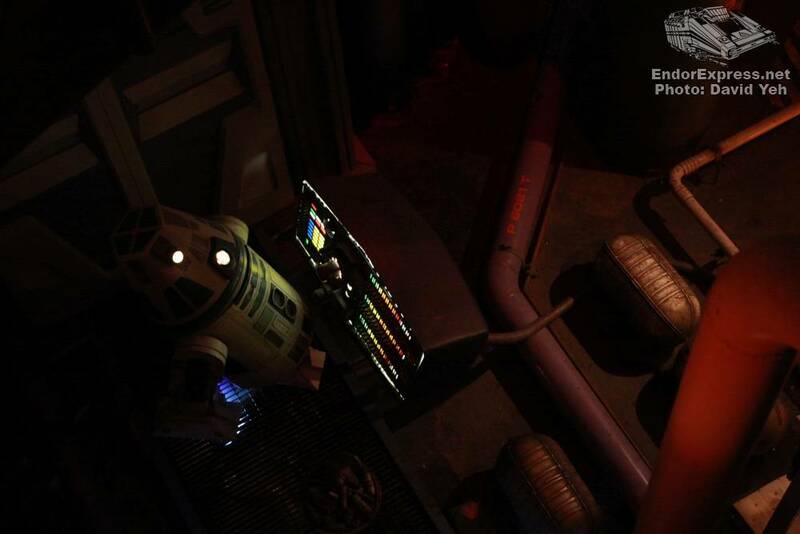 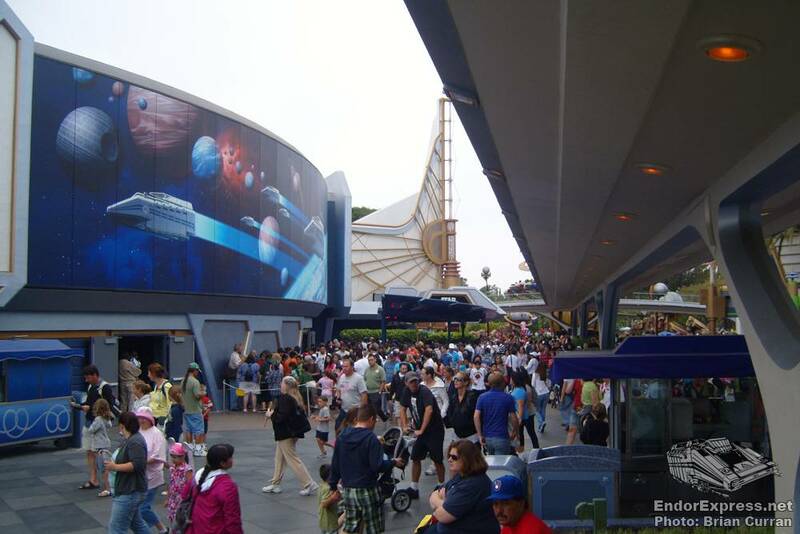 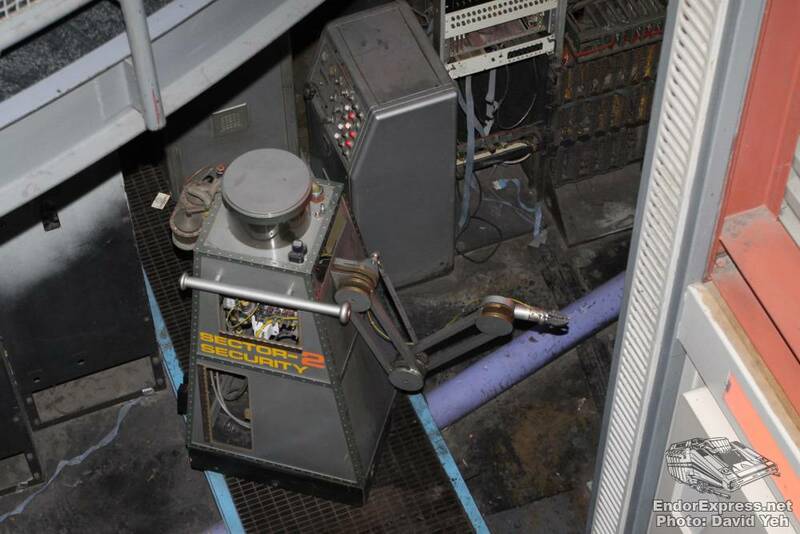 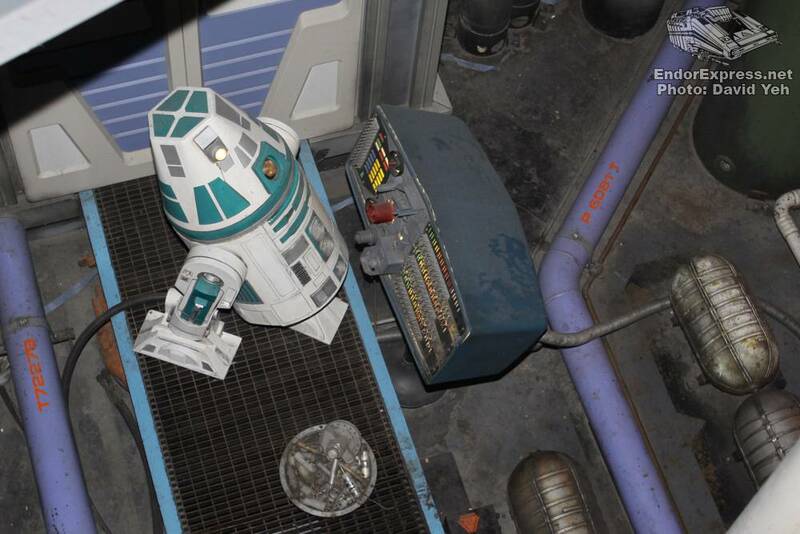 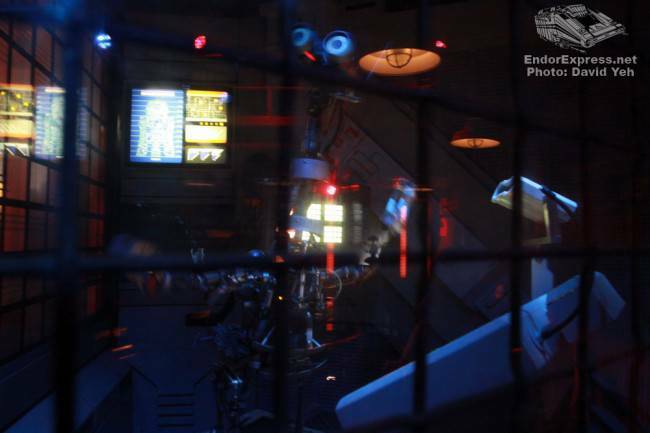 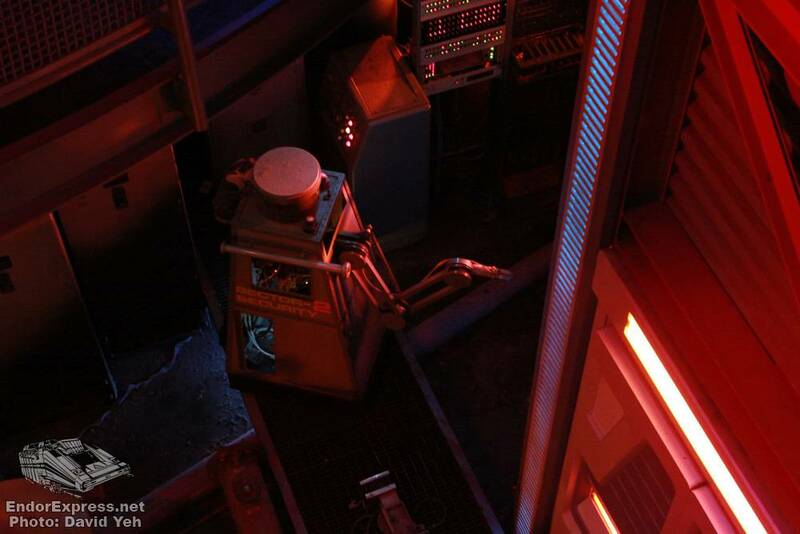 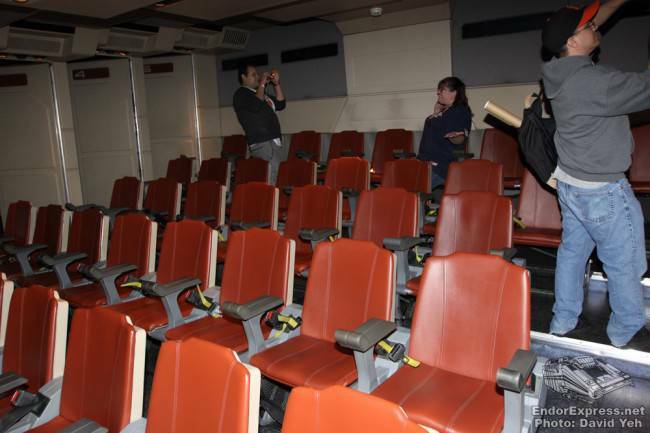 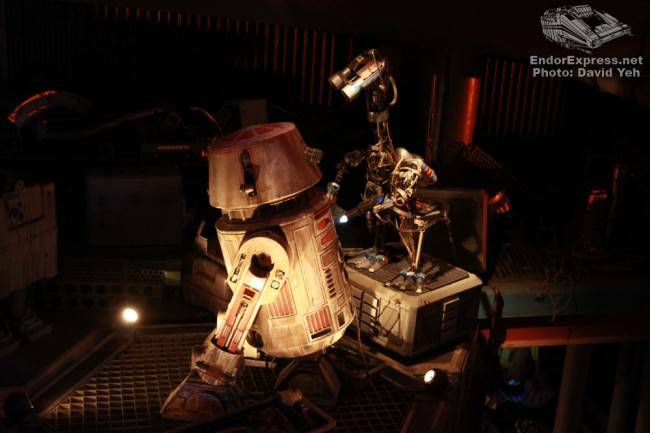 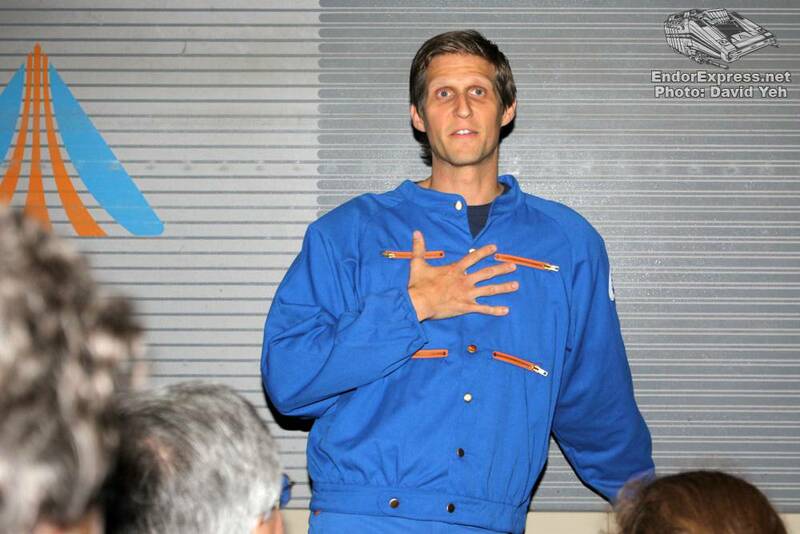 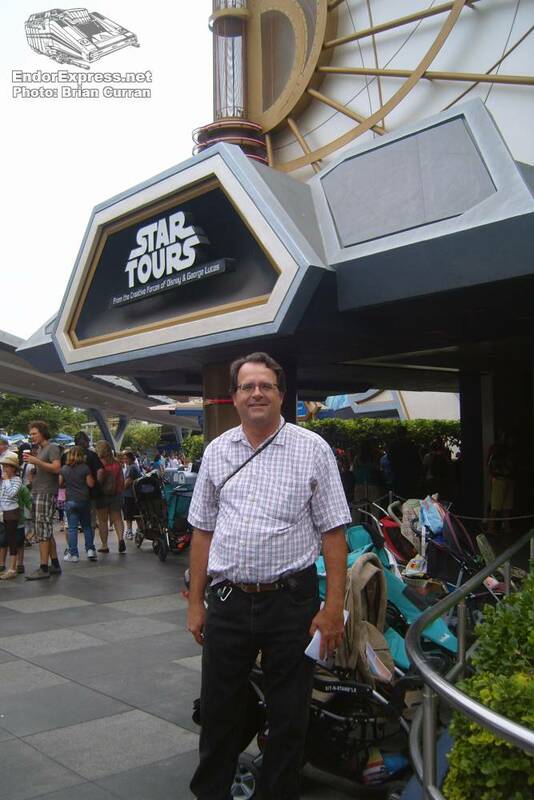 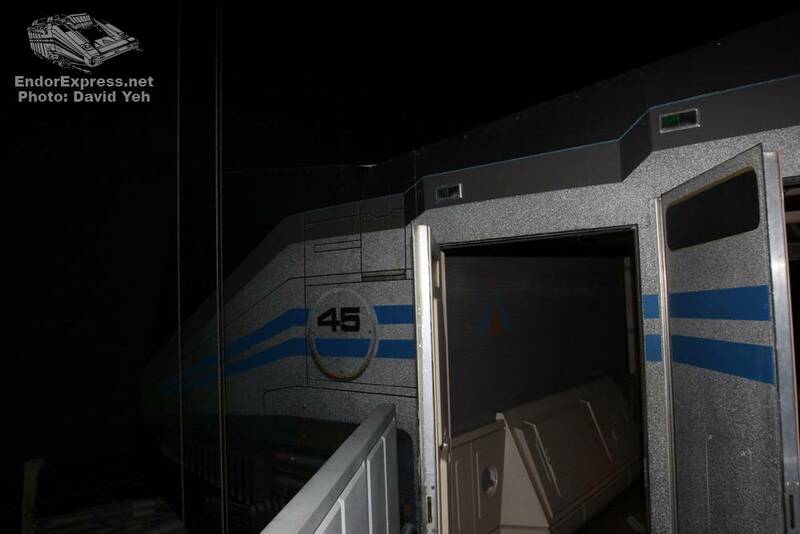 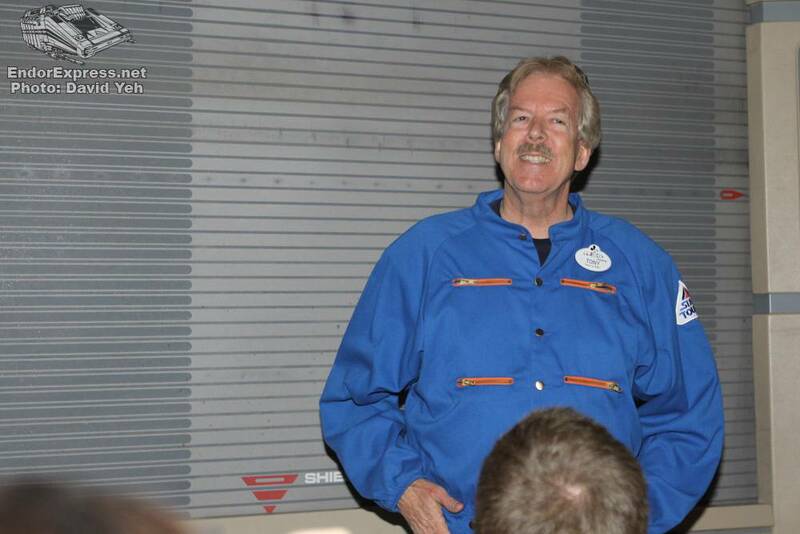 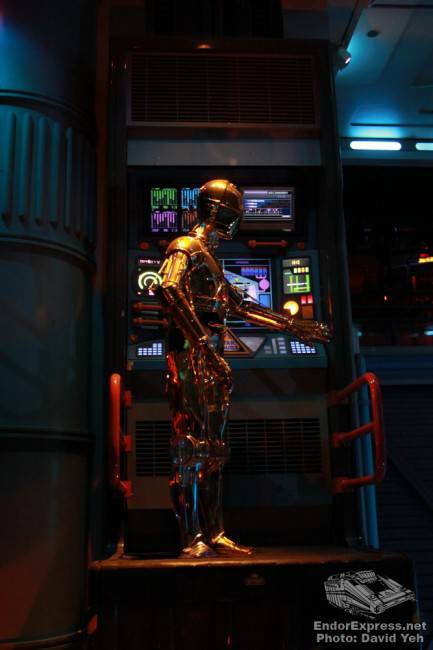 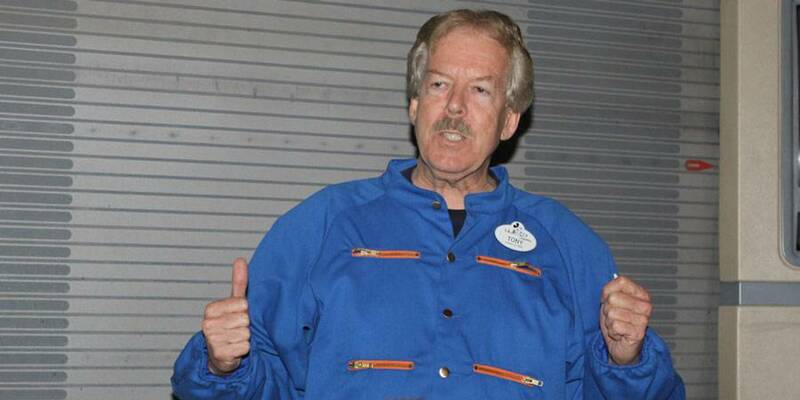 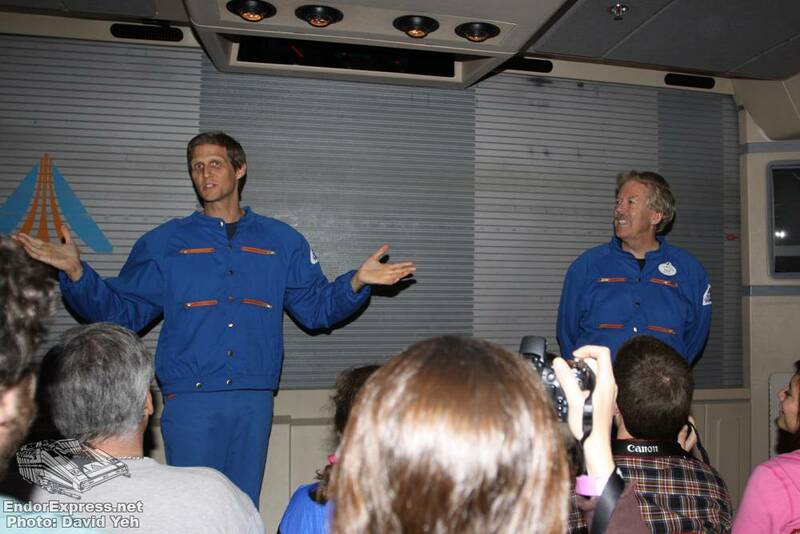 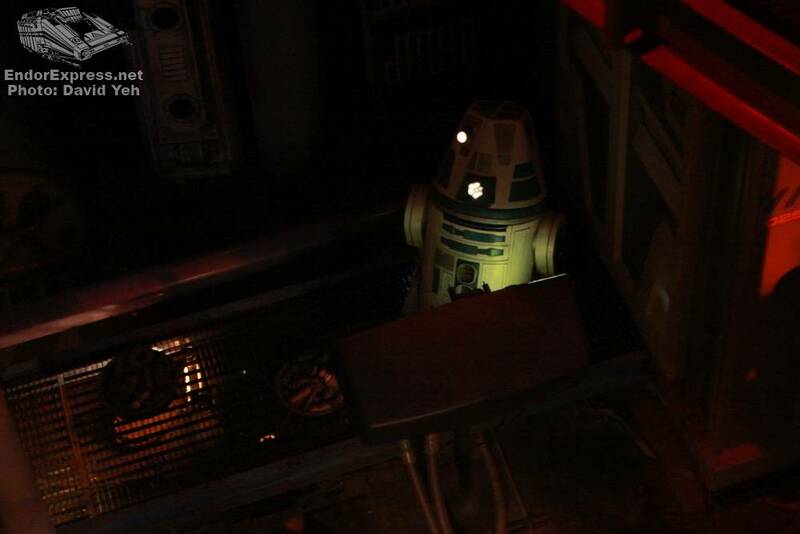 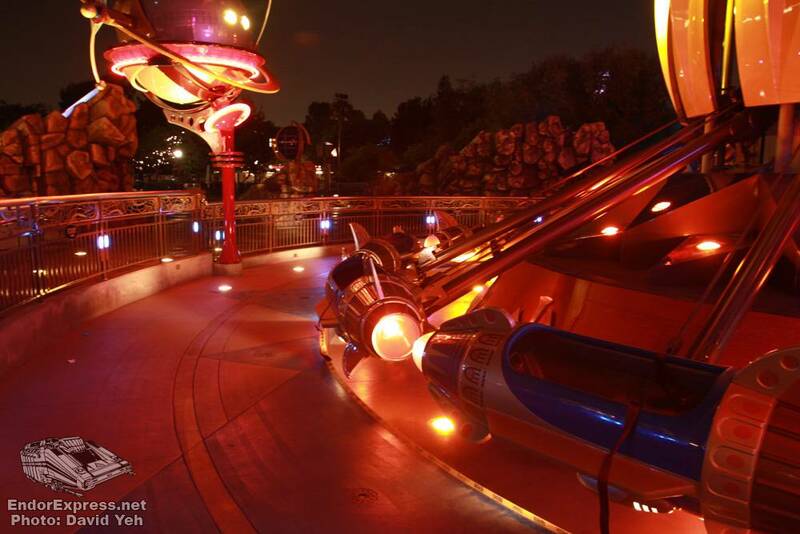 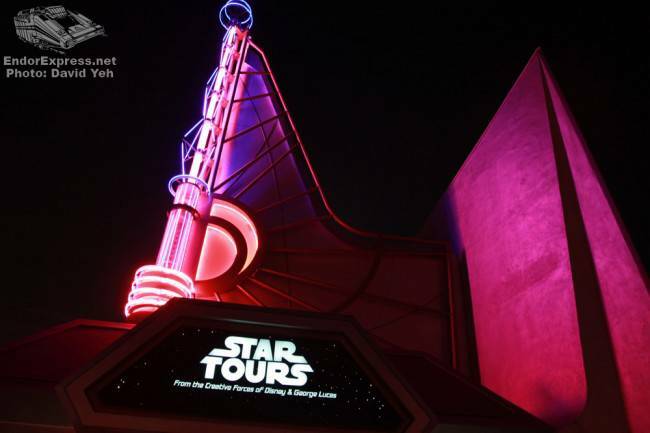 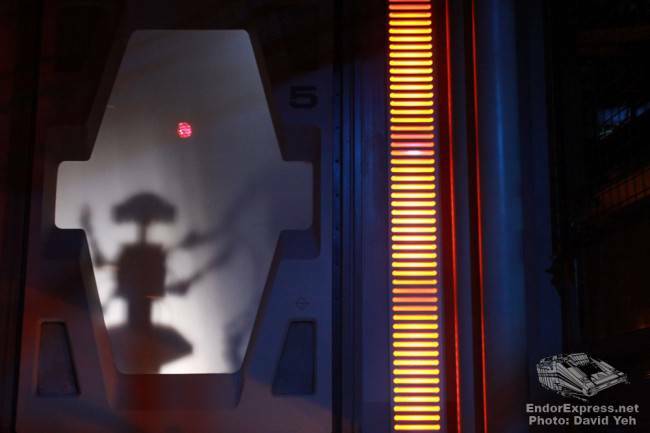 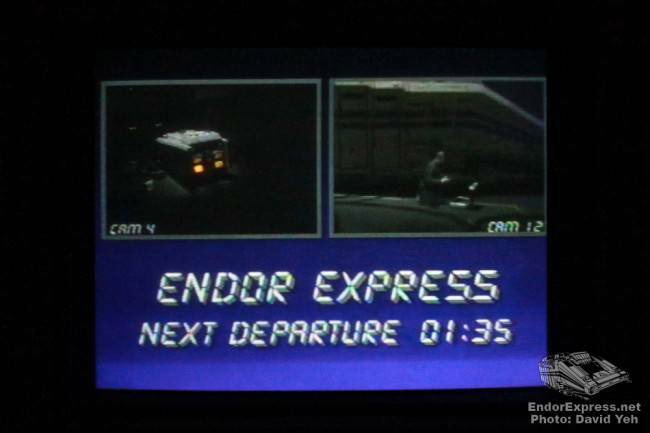 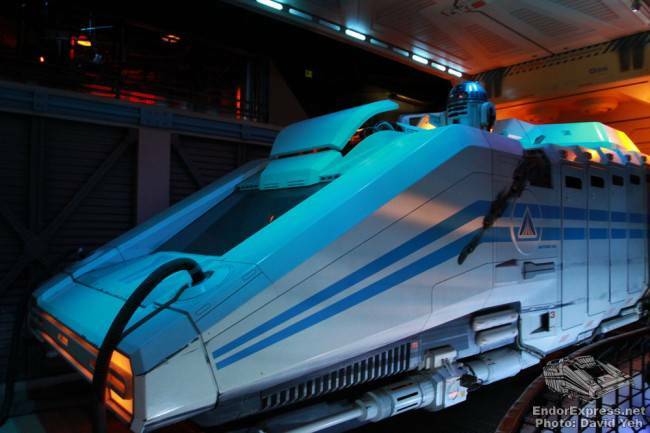 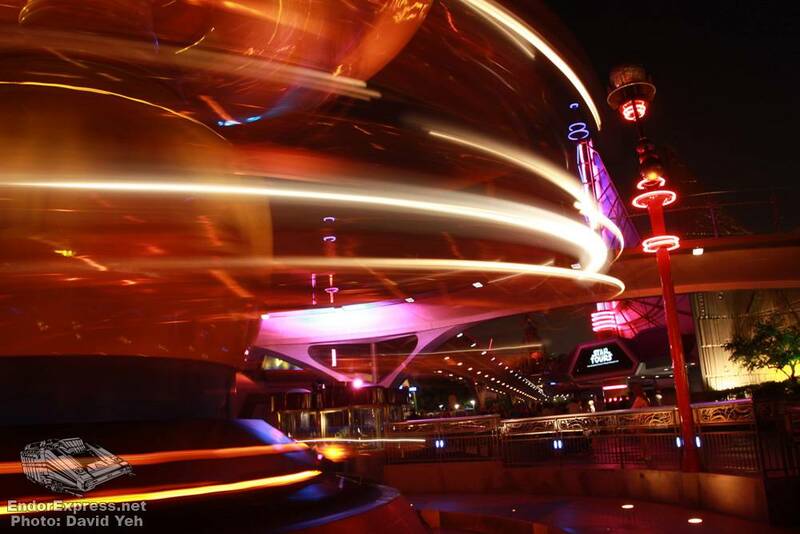 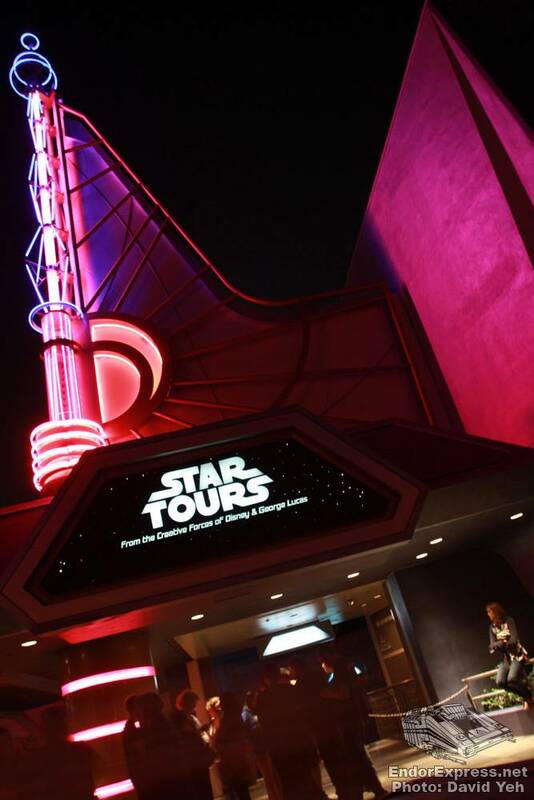 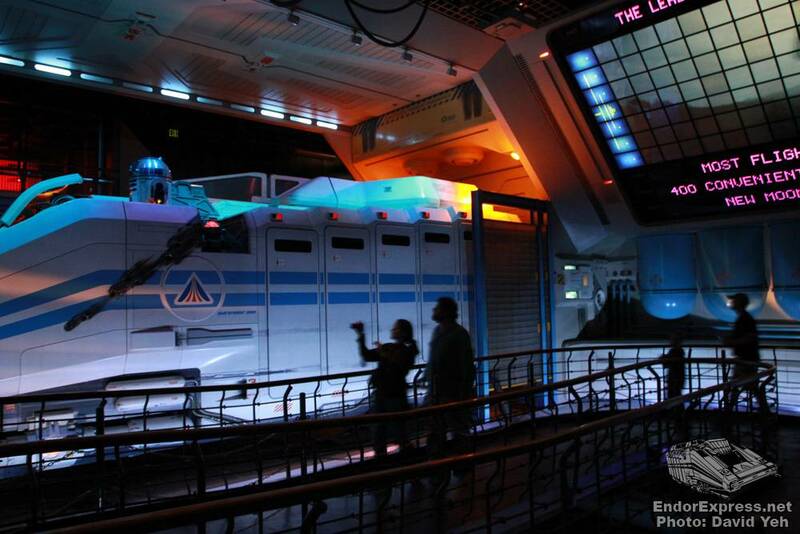 Former Imagineer Mark Eades was at the park to take some pictures for his Star Tours article in the OCRegister. 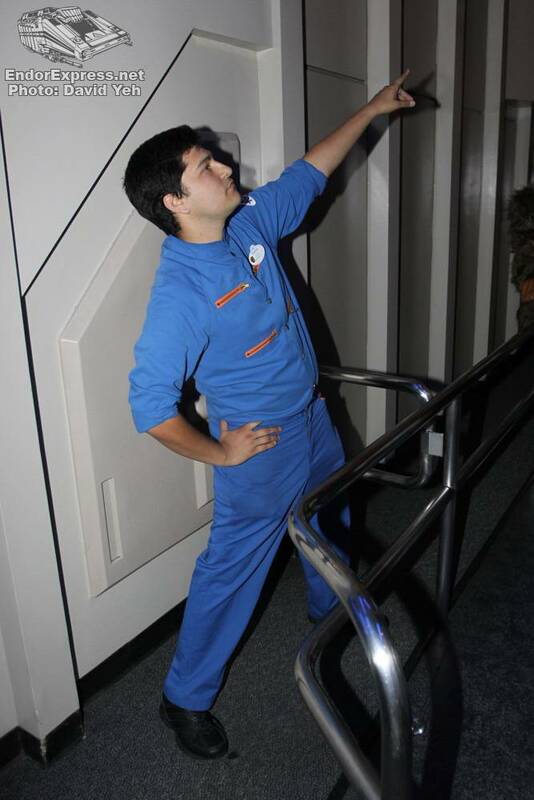 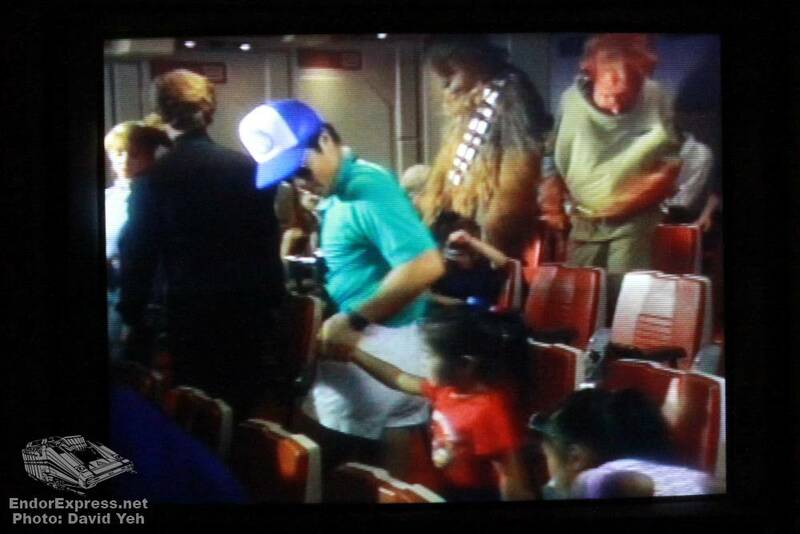 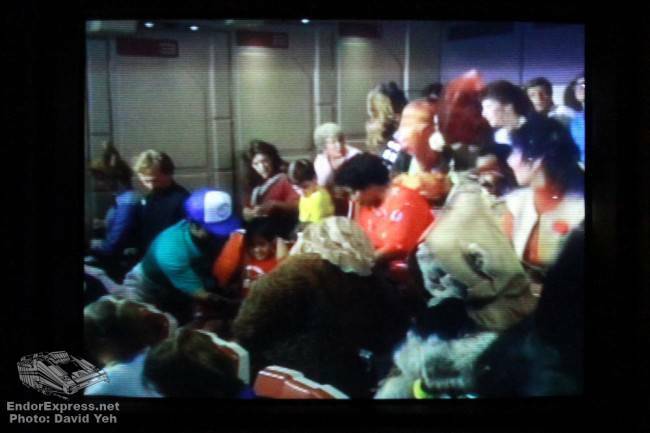 The Star Tours cast members were having fun with the crowds. 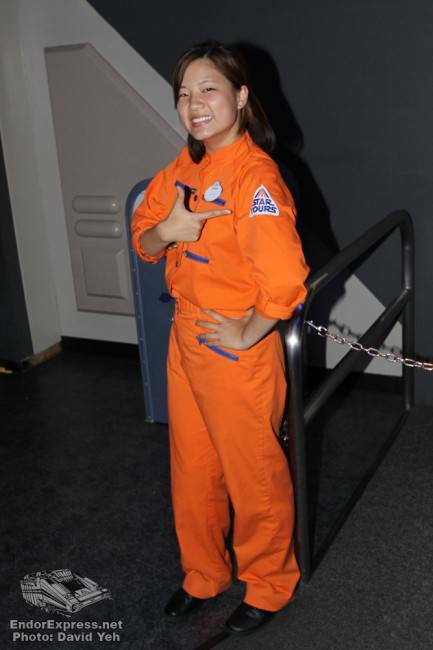 Often being asked to pose for pictures. 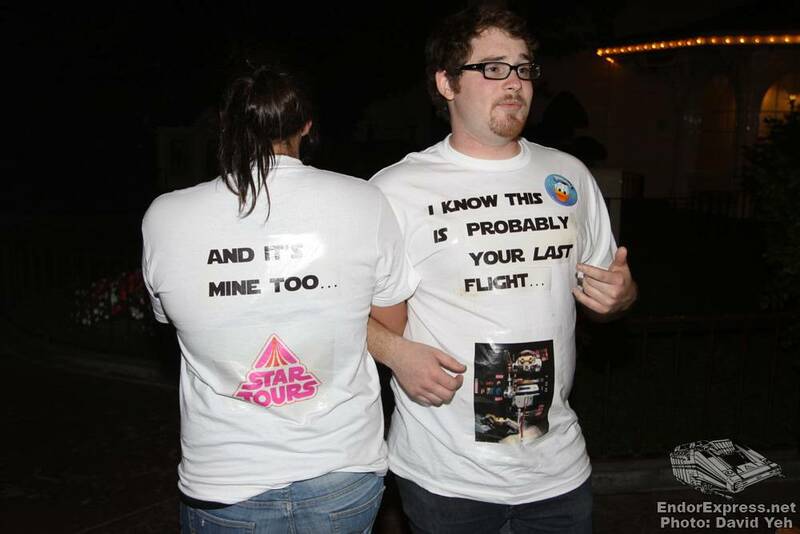 Several Star Tours fans made T-shirts for the last day. 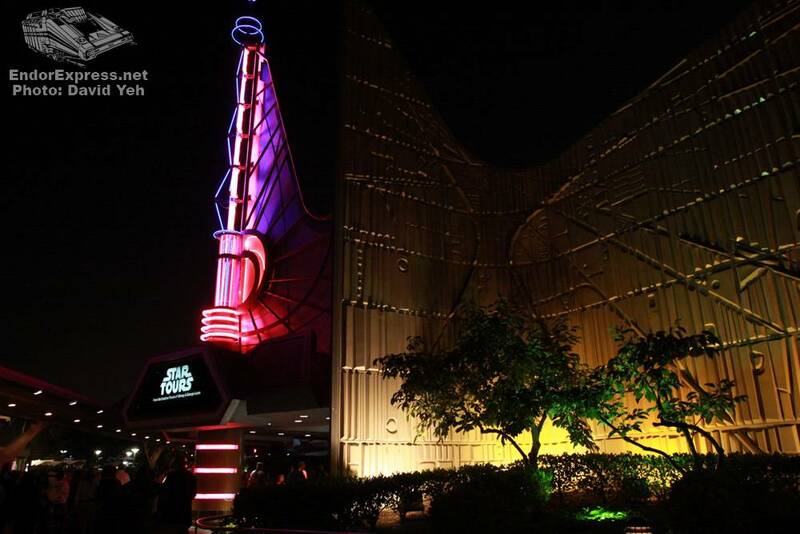 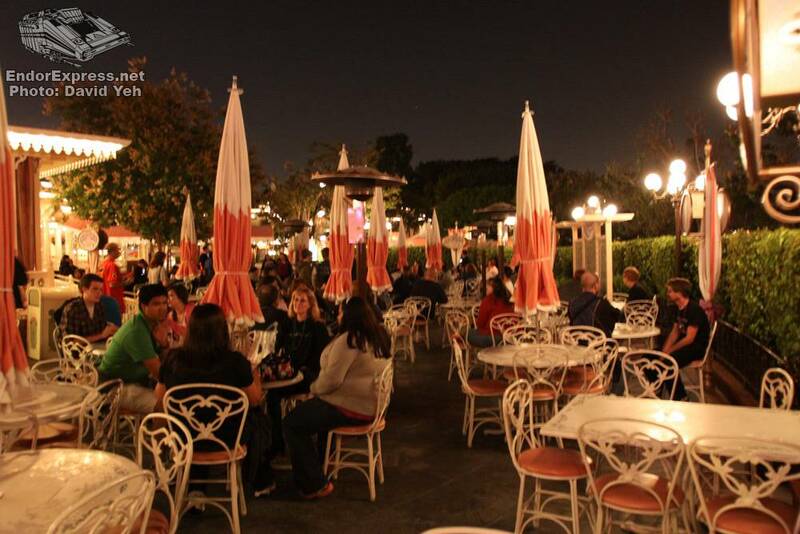 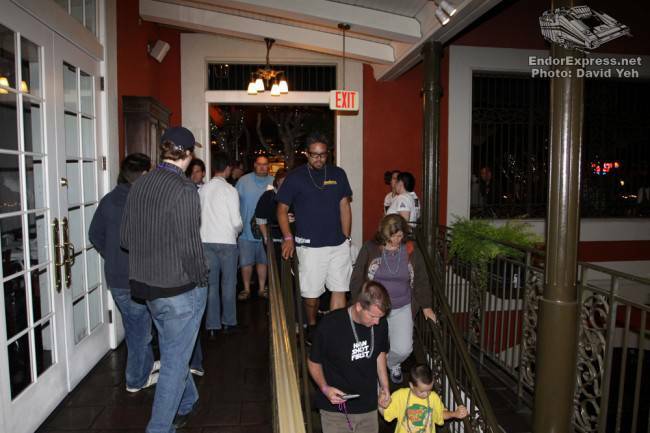 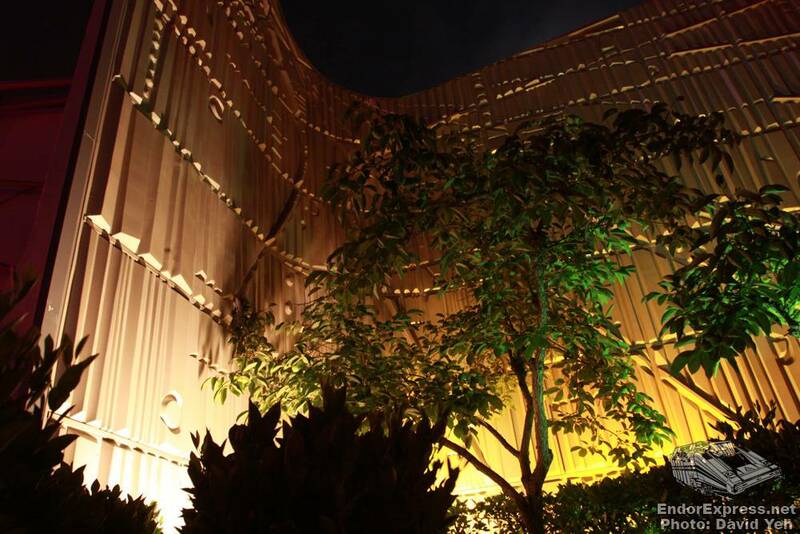 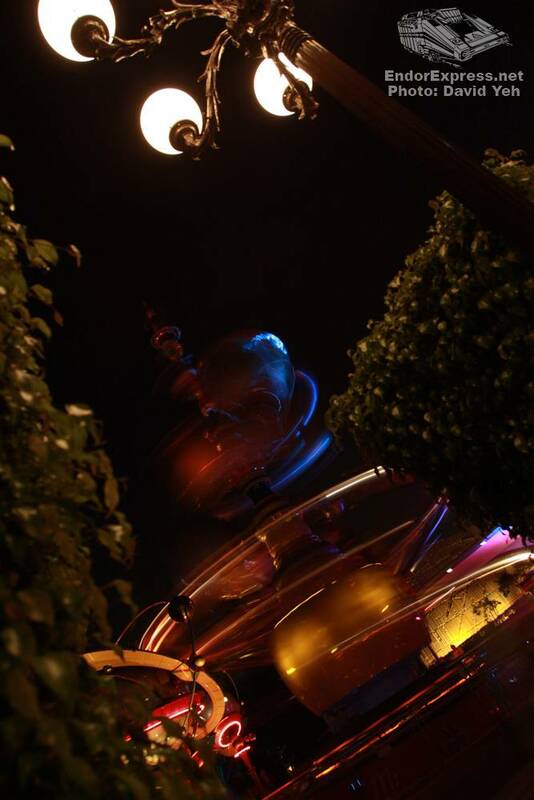 At 10pm the lucky D23 members could check-in at Ralph Brennen’s Jazz Kitchen in Downtown Disney. 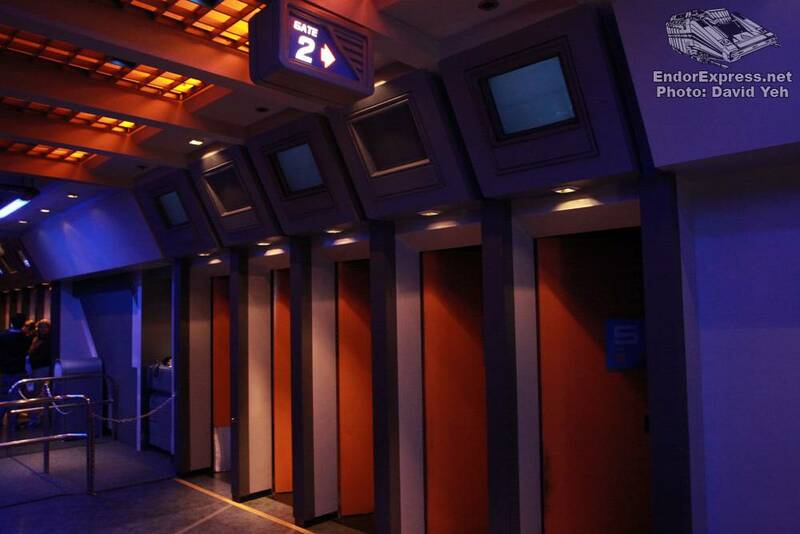 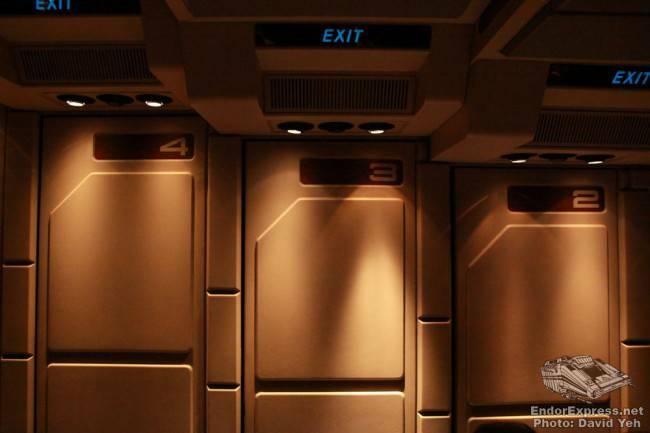 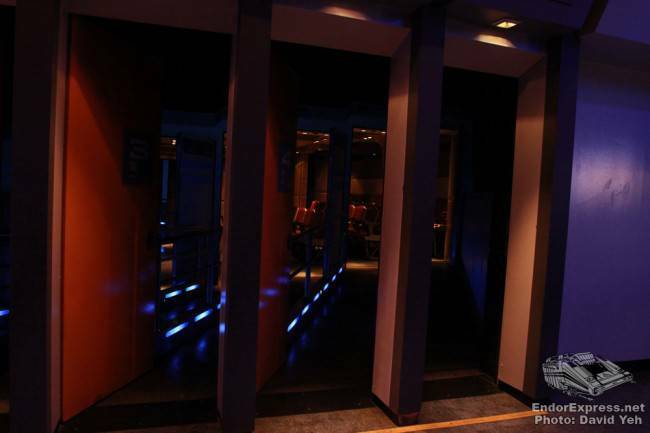 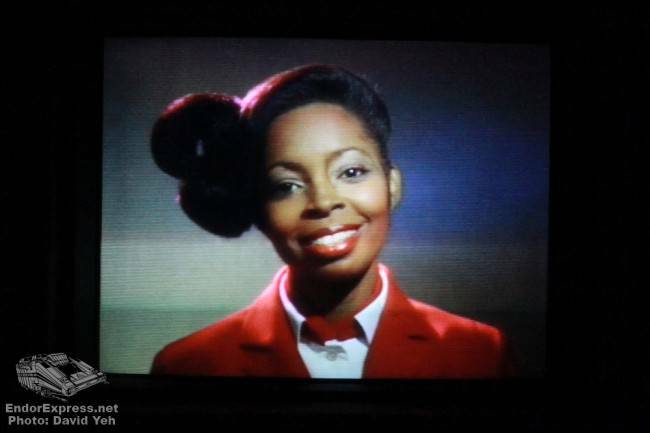 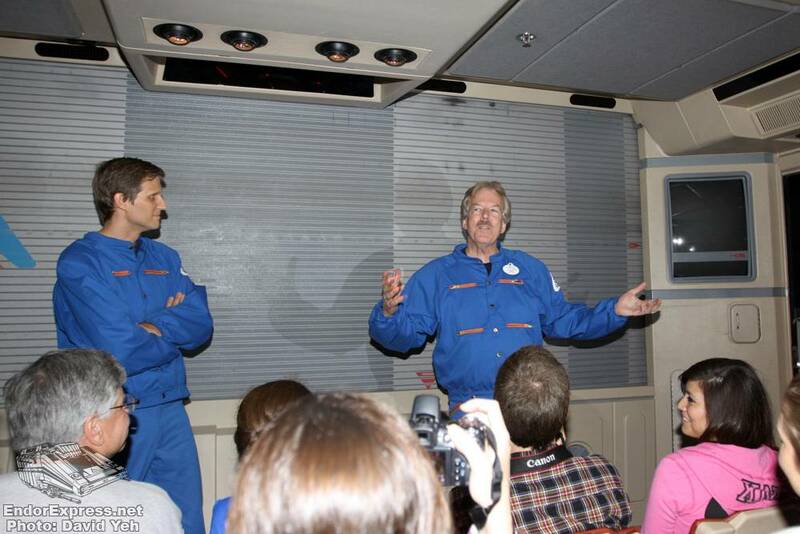 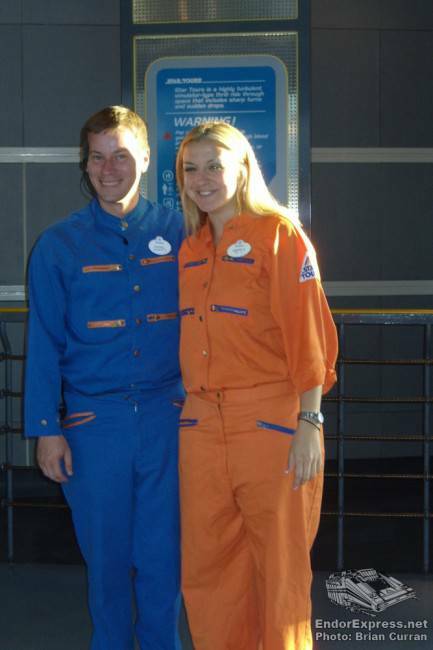 Where you were given a special D23 Star Tours Boarding Pass. 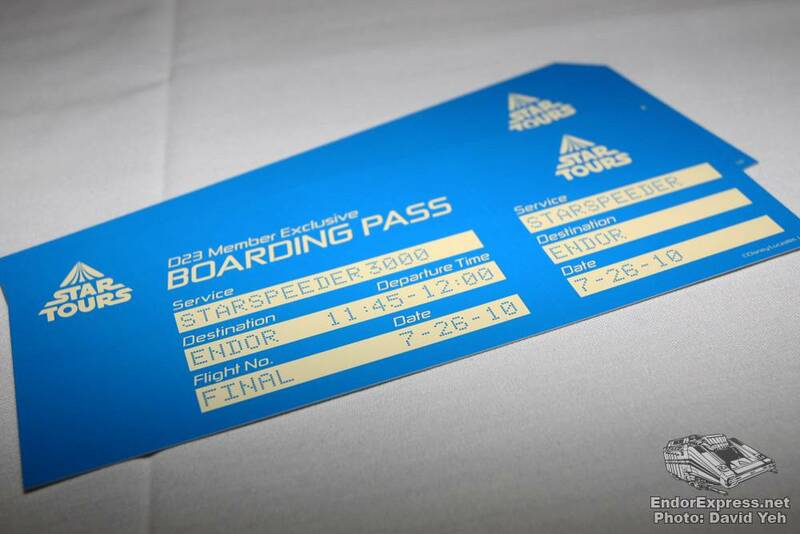 The Boarding Pass is like the Passes Disney gave out for Cast Previews in 1987. 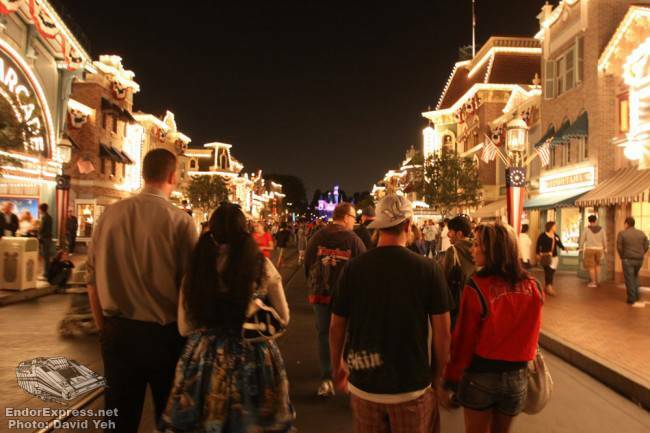 Around 11:15pm we made our way from Ralph Brennan’s, through Downtown Disney. 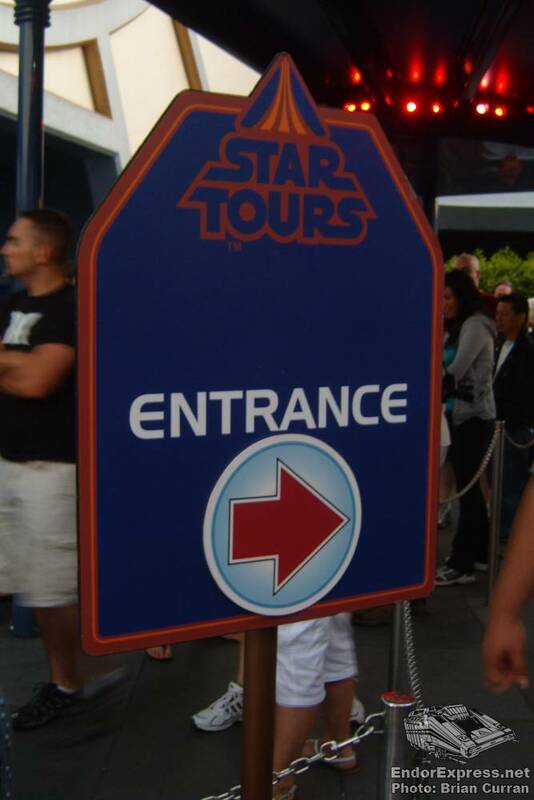 Entered Disneyland through a side gate. 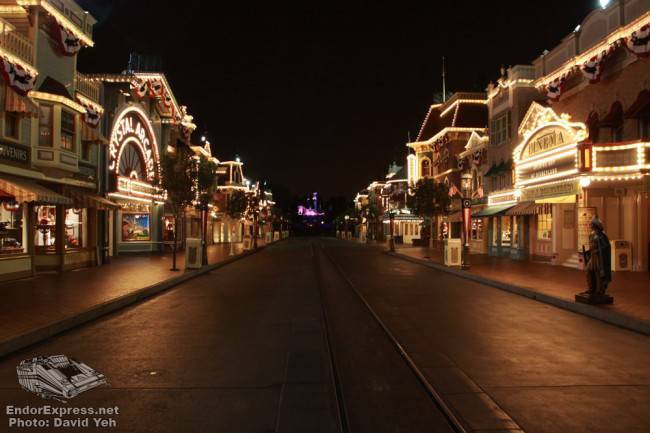 Walked down Main Street U.S.A. to the Plaza Inn. At the Plaza Inn we were told we could go on a few rides, shop or hang out until midnight. 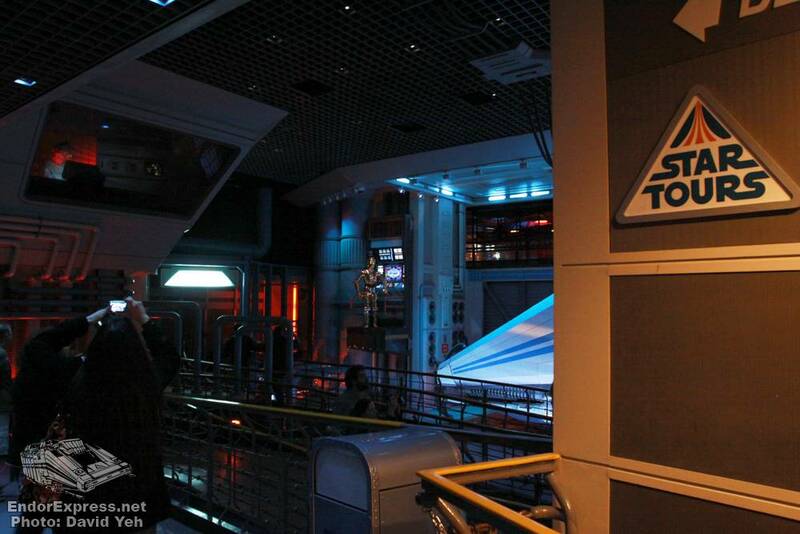 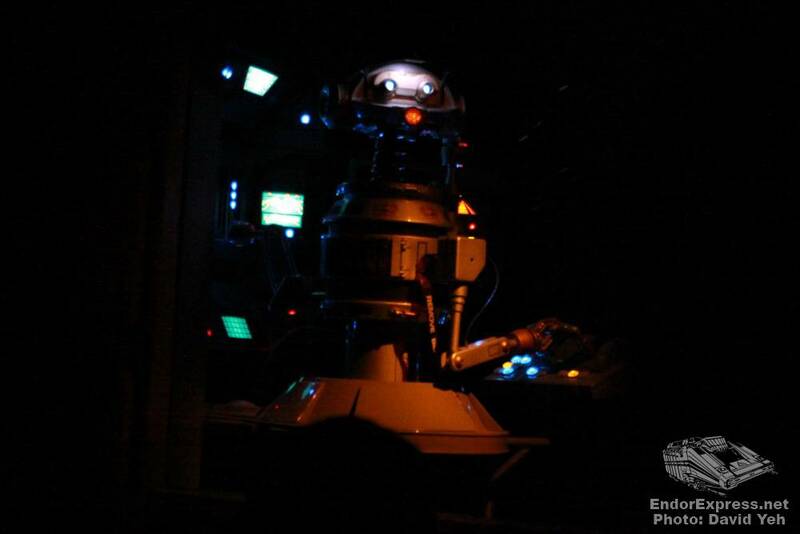 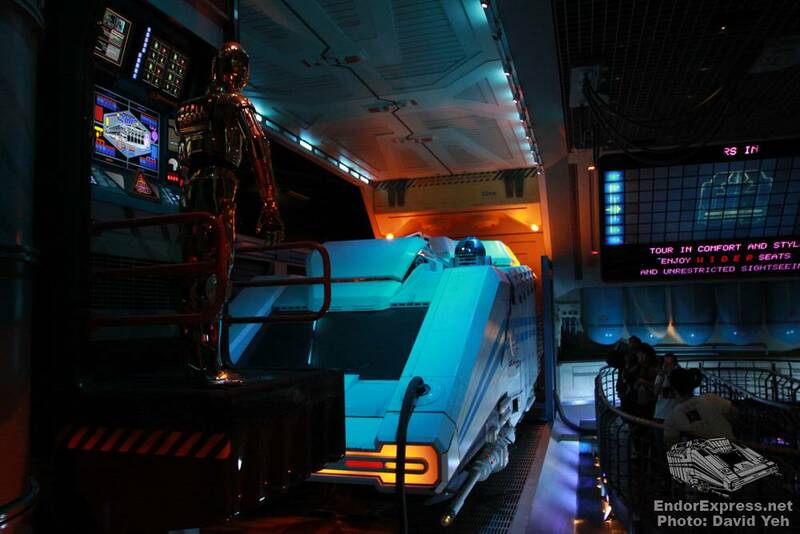 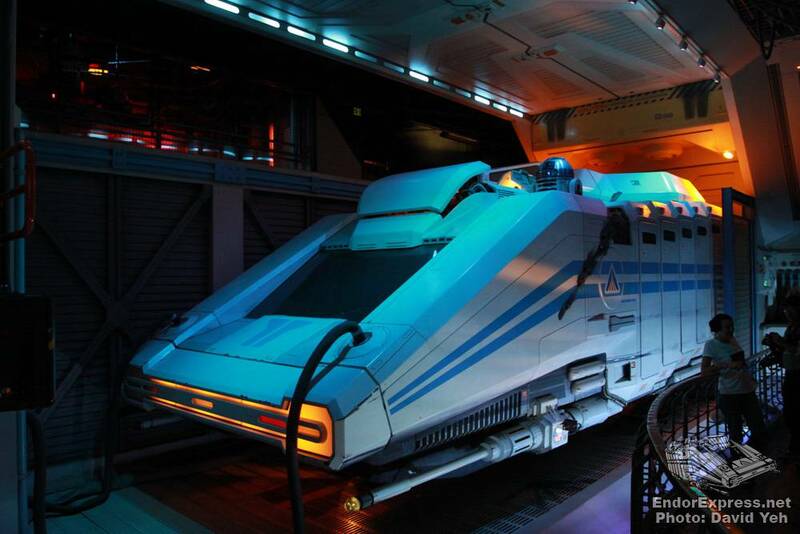 We went over to Star Tours to take some pictures. At midnight we checked back in at the Plaza Inn and waited for our Final Flight. 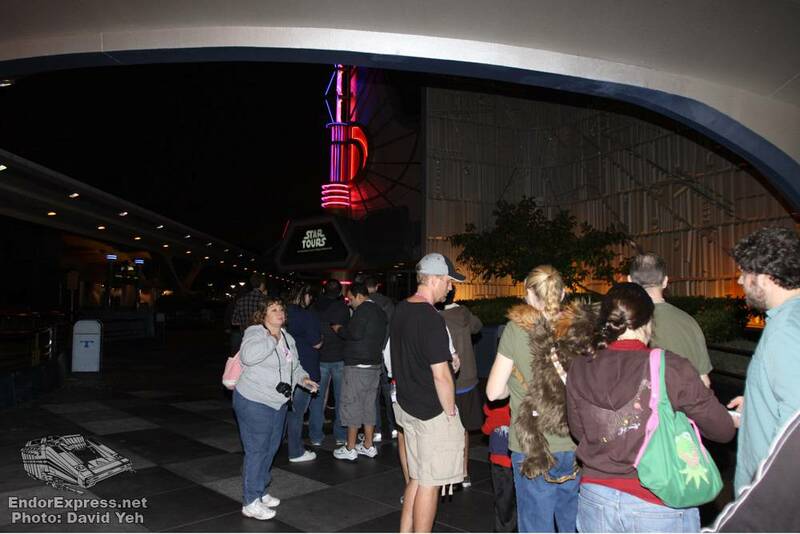 Shortly after the park closed we were lined up in front of the entrance to Star Tours. 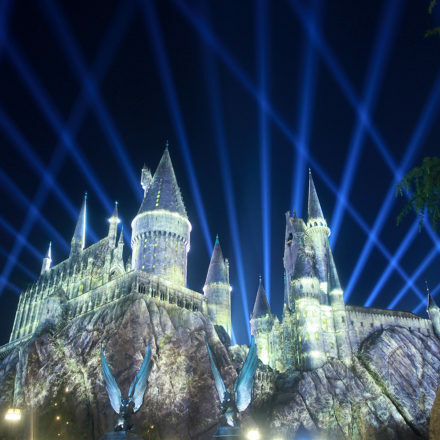 Our last chance to take pictures and say good-bye to some old friends…. 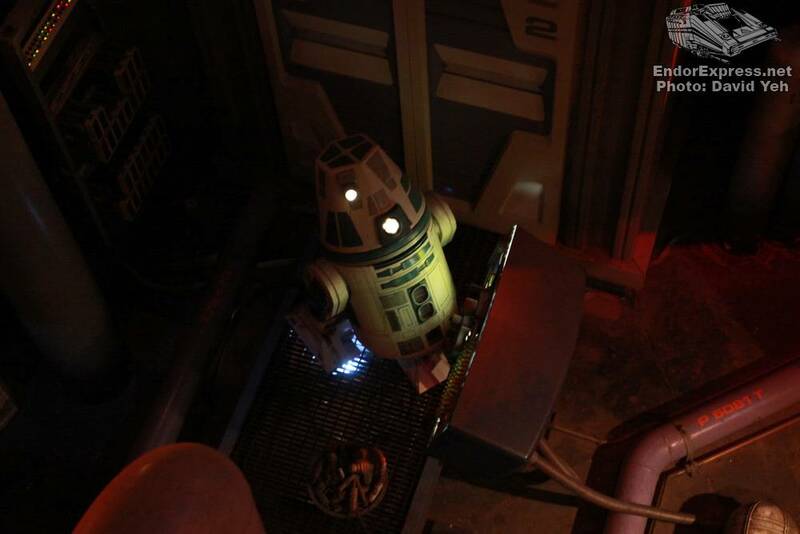 How many of the Sector 2 droids will be back next year? 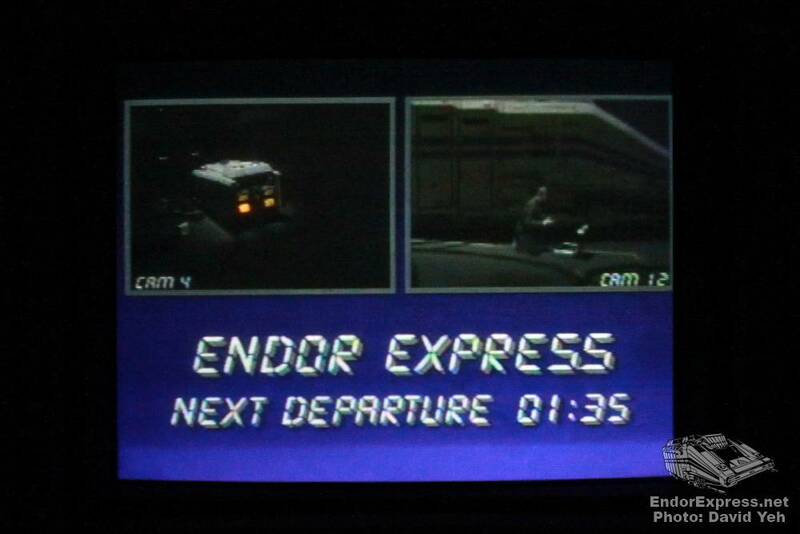 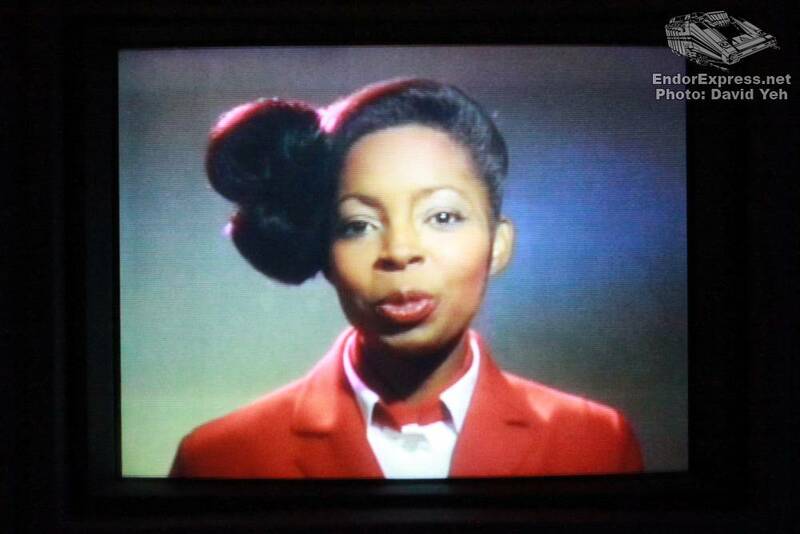 The last time the safety video was played? 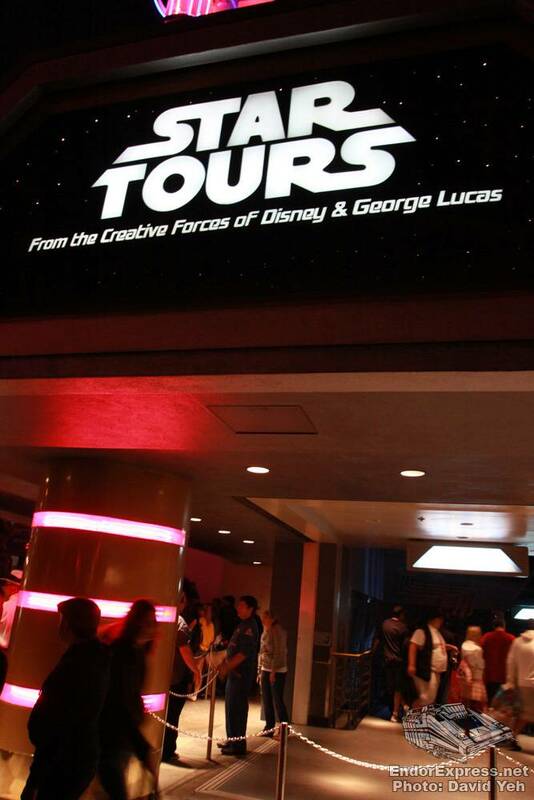 Sorry Clone Wars fans. 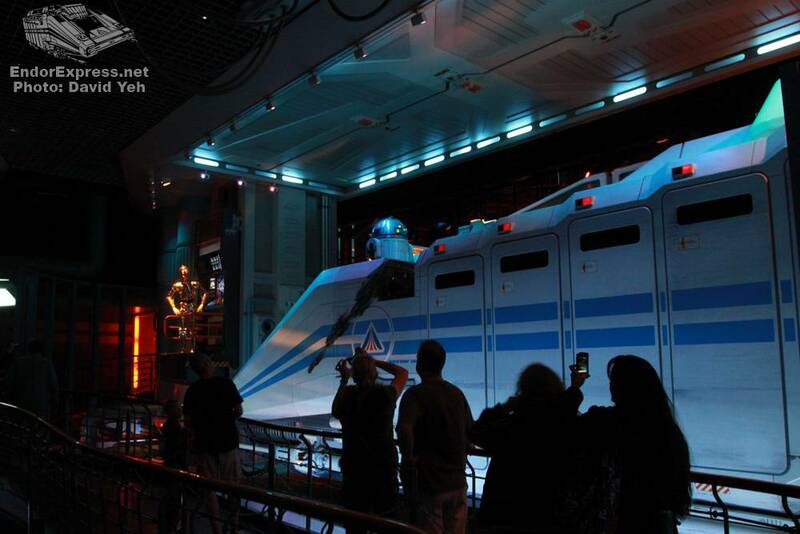 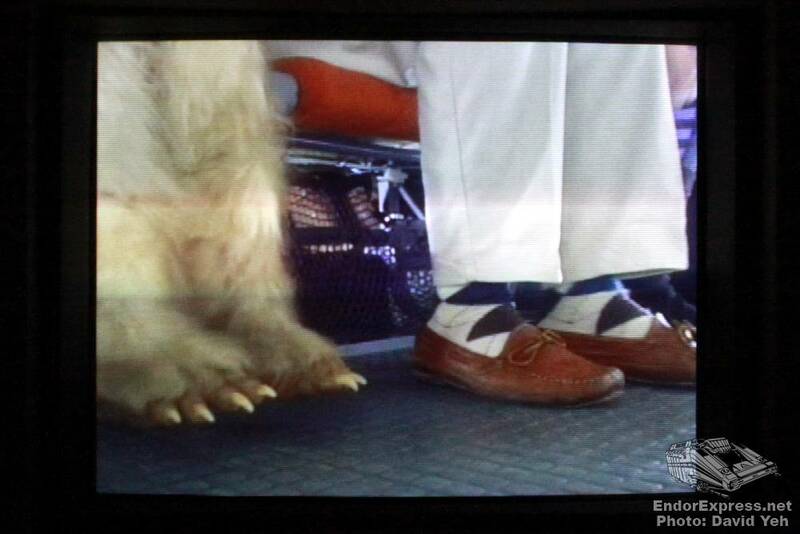 Here are a few photos of the real Captain Rex! We were the last out of the cabin. 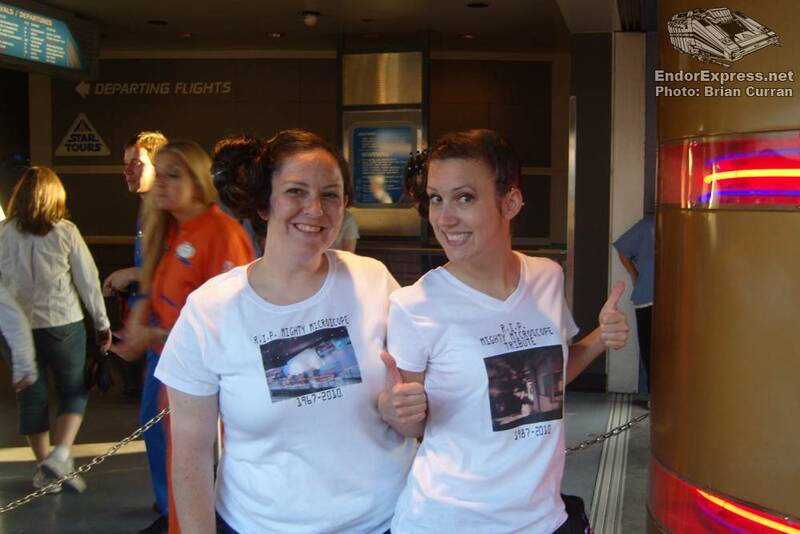 We wanted to take a few more pictures. 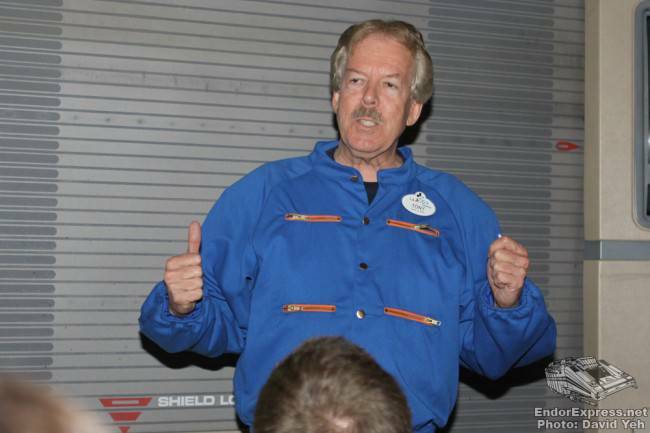 As we exited the ride vehicle we were given a Final Flight badge. 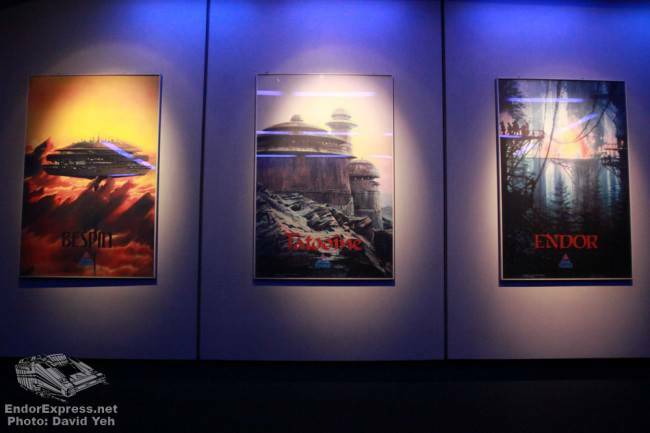 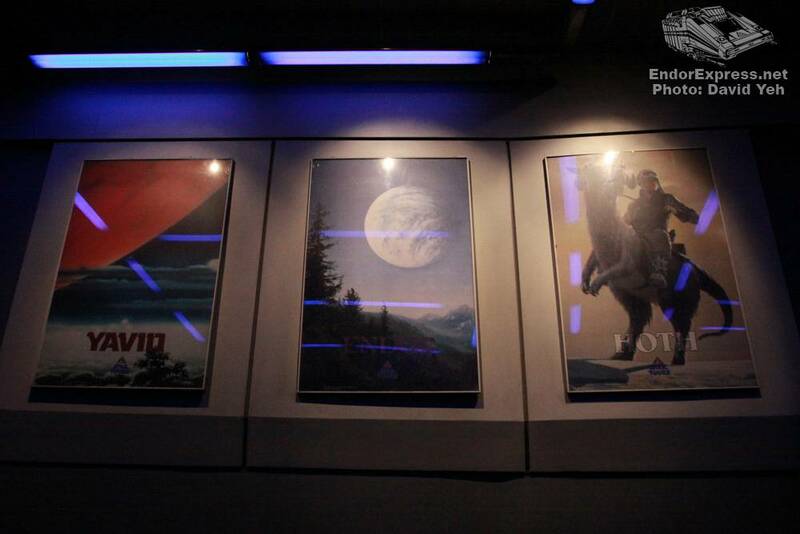 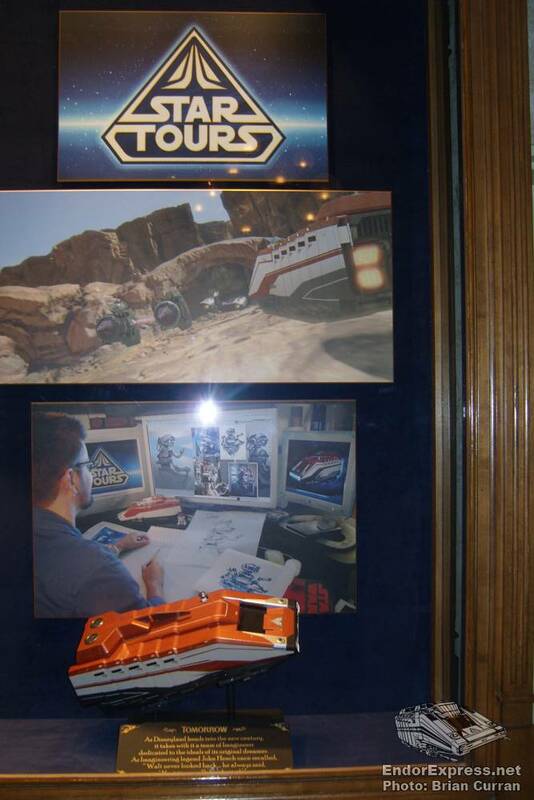 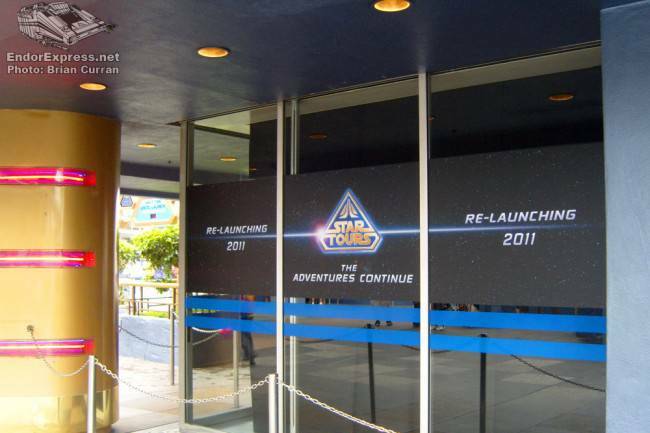 A last look at the Star Tours destination posters. 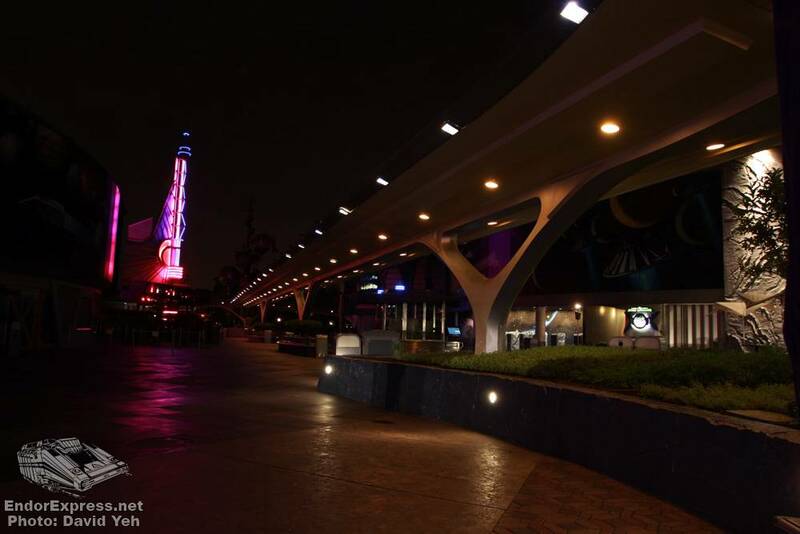 It was pretty cool walking through Tomorrowland and down Main Street with only a few other people in our group. 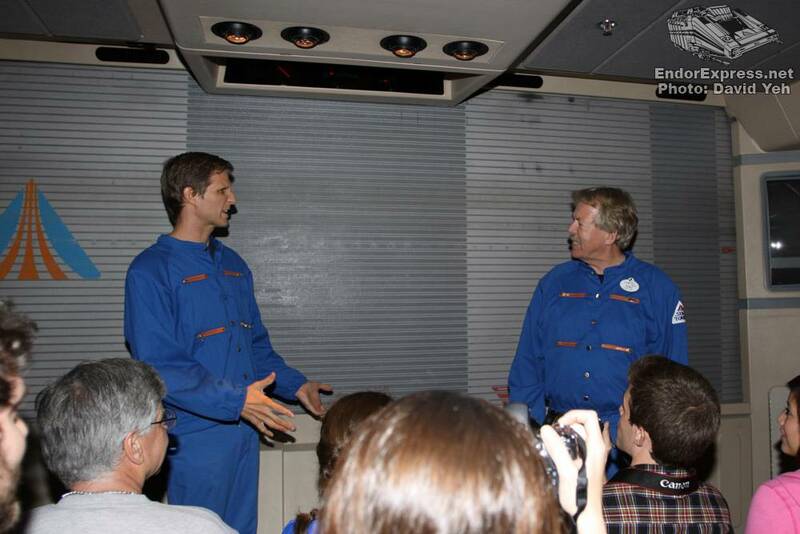 i WAS oN THE VERY LAST FLIGHT OPEN TO THE GENERAL PUBLIC AND THE 1ST PERSON ON THE 1ST RIDE OF THE DAY.